Report back on the 2017 Bonanza event at Dullstroom by Peter St Clair. FOSAF NEWS - Report back on the 2017 Bonanza event at Dullstroom by Peter St Clair. At a small function held on 29th October I was able to complete my responsibilities as 2017 BONANZA Convenor by announcing the winner of the Best Water floating trophy as well as the amount, agreed by the DFFA Committee, of this year’s donation to Helping Hands. The Best Water floating trophy is based upon several factors including, competitors’ assessment and number and size of fish caught. I am delighted to announce that the winner of this year’s Best Water trophy – with 27.5 points – is Walkerson’s Long Final water. With 19 points, joint runners up were Walkerson’s Production and Brookwood who were followed by Jurassic Pond and Dunkeld Lake Pleasant. Tobie van Niekerk accepted the trophy on behalf of Walkerson’s. To the owners of all waters who gave us the use of their dams for this event, a big thankyou !! Last year a donation of R85,000 was made to Helping Hands but in view of the fact that we were a couple of participating teams less this year and there was significantly less in the ‘float’ carried over from last year, the Organising Committee set this year’s target at R75,000 as our hoped-for donation. 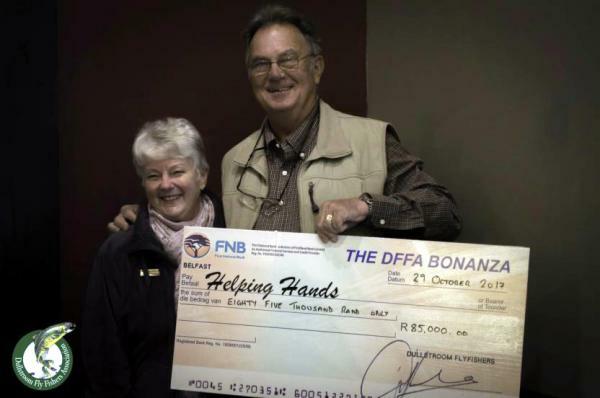 However, after finalising the accounts, the DFFA Committee endorsed the recommendation of the Organising Committee and it was with great pleasure that we have been able to hand over a cheque to Helping Hands for R85,000 – equalling last year’s record donation. The DFFA and BONANZA Organising Committee are extremely proud of this achievement which would not have been possible without the help and support from all of you. A humble ‘THANKYOU’ from us all! The DFFA Committee will appoint a new BONANZA Organising Committee for 2018 during the early part of next year. However, I have advised the DFFA Committee that for personal reasons I will not be available to assist. I would like to sincerely thank everyone for their help and support during the seven years I have assisted with our BONANZA’s and trust that future events will continue to be as successful as this one.